It’s after ten p.m. on a Friday night, and I’m just barely getting around to a post that under normal circumstances I would have published Wednesday morning. I’ve hardly touched my novel this week, either. I’ve hardly paid attention to my children. All because I decided it would be a fantastic idea to play around with another craft. I remember Martine Leavitt telling us in a weeklong workshop that writing novels is an exclusive craft — exclusive in that you pretty much have to eliminate everything else from your life except family and work. She even mentioned ditching your morning date with the newspaper or the internet if that’s what distracted you from writing. Most of the time, I’m good at that. I’m home with my kids all day, I have my part-time job two evenings a week teaching composition, and then I have writing. When my life revolves around those three things, I’m pretty well balanced. I even fit in blog posts, since I consider those part of writing. 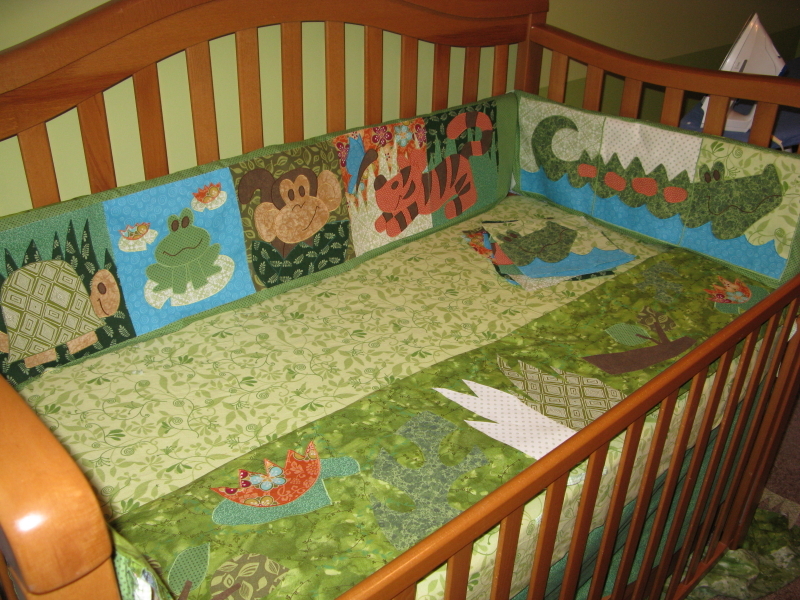 But when I get insane ideas in my head that start with “Well, the room is already painted green, so a jungle theme would work well for the baby” and morph into “In fact, I could create the bedding myself,” that’s when my life spins out of control. Because now I’m 37.5 weeks into this pregnancy, I have 5 days until fall semester starts, and I’ve spent 40 hours this week hunched over a sewing machine and the bumper is still not done. 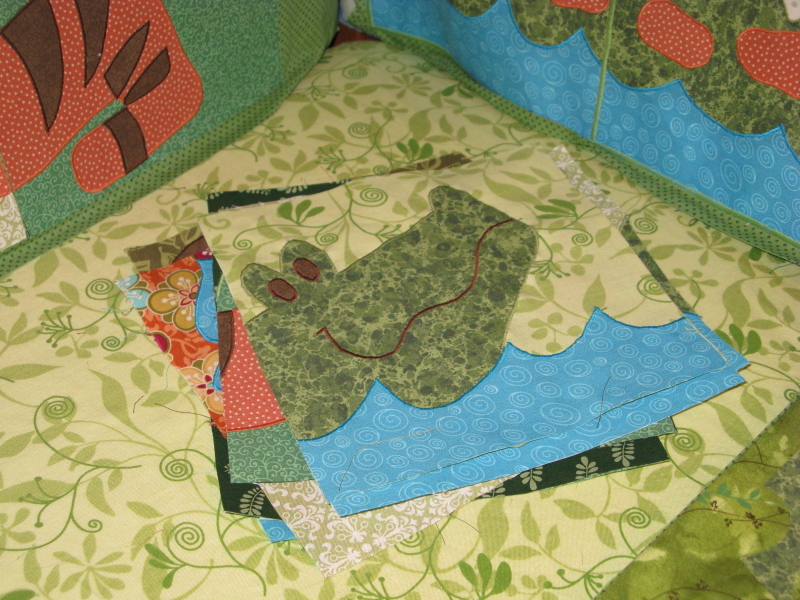 I’ve learned a lot about applique (i.e. satin stitching around the edges of cut-out fabric shapes), a lot about how to troubleshoot problems on my sewing machine (it knows fifty different ways to jam up, apparently), and a lot about why Martine said what she said. My neighbor across the street is a sewing wizard. She always has a quilting project going, or applique, or curtains, or something. And that’s her thing, so she fits it in here and there the way I fit in writing. And the longer I sit chained to my sewing machine, knowing I need to get this finished or I will go crazy, the more I’m convinced that I need to just stick to writing. This stack of squares represents way too many hours of time I could have, should have been revising. What about you? What’s your “one” thing and what distractions sometimes derail your focus? The bedding is fabulous! It’s so so cute. You did awesome. As far as what distracts me other than my kids? I’ve pretty much given up everything other than my family, church and writing. One night a week I watch a show or two with the fam. But that’s it. And my writing has gotten better. Maybe there is hope for publication after all. Aw, thanks. One of those things my mom taught me growing up that I rarely use but now and then figure I should. Holy Moly! That is amazing! What do you NOT do Nikki? Ha ha. Have you met my parents? For example, I certainly can’t dance, and they have newspaper photos proving they can. Hey Nikki! It’s been forever. Well, I totally unerstand. I haven’t been writing much, or really, at ALL, lately because I have been so busy with other things. But hey, you made some super cute stuff! That’s so cute! As for my distractions, well, I discovered recently that when I don’t want to do something, I bake. Yesterday when I should have been preparing my lesson for that day, I made chocolate-chocolate chip muffins and apple crisp instead. So, yeah, baking. And kids and church and this thing I keep hearing about—exercising??? Yeah, I think I’ve heard of that, too. I’ve been to the gym exactly one day in the past five months. Oops. But baking sounds yummy! Want to come over and bake my huge zucchini into bread? I’ve been meaning to, but it’s sat on my counter a while. Um, if you could be LESS talented that would be really helpful to the rest of us. Thanks. I always think of you as my second daughter – not that you need another mother; yours is wonderful. You, like my own daughter, always commit 150% to everything you do – family, faith, work, writing, crafts . . . We should all be so dedicated. You ask about the one thing – I love to sew. It is my favorite craft. My puritan ethic thwarts me routinely. “You can do that when you have finished all your chores.” Work before pleasure. As a result I seldom sew. As I write this in my twilight years, I think I want a redo. As I write this I am planning a revolt in my life. As I write this I am changing. PS Prayers that your delivery is smooth and the child wonderful. I had no idea; I would have thought knitting was your craft. Your work ethic is commendable, though. I’m sure my husband wishes that my dedication to things extended to housework. Thankfully he takes over where I slack. My theory is that the purpose of life is to learn balance. Good luck with your revolt!